October means cake. 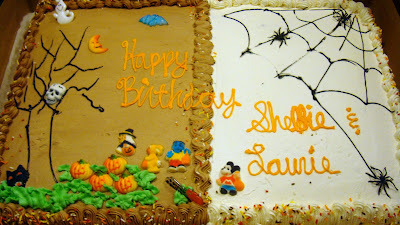 We celebrated the cake part joining Shelbie and Laurie's birthdays. The cake turned out so cute. Lehi Bakery, again. 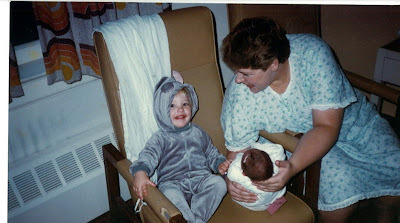 The pic of Halloween past in homemade costumes. This was 15 years ago in a rental home while we were building our existing house. I was still pregnant with Mason. It is funny now to look at this picture and pick out personalities as they are now older/adults and connect to the kids they were. 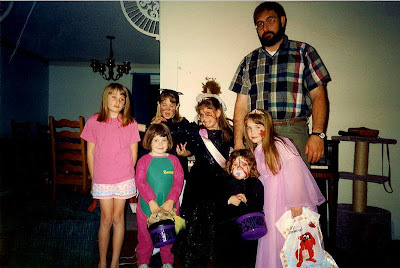 Tracey (back row far left) was sick that Halloween. She had strep. You can see how sick she was. Poor kid, what a horrible time to be sick. Next to her is Whitney (Tracey's twin) the new mom. Whitney was a cat. What else?, she still loves kitties. Shelbie is next to Whitney and it was Shelbie's birthday. She has her zombie beauty queen with sash and blood make-up. She and Whitney are striking a pose. Next to them is Mr. Hive. A man of much patience. Front row in the Barney suit is Jamie. She loved that costume and loved Barney. I think Jamie wore that Barney suit nearly everyday until it gave her the "thong" effect. Next is Laurie. I belive she was a witch. But of course a witch sporting a pacifier, so a sweet little witch. Both Jamie and Laurie rocked the pacifier well into their 4-5th years. Oh well, they don't have one now so what does it matter? Right? And then next to her is Chelsey. Of course, Chelsey the princess! She's playing for the camera in her crown and lovely lilac dress. I don't know why Natalie isn't in this picture. Oh, those were the days. Baby Allison came yesterday with her mom to spend the day with us. You can see from her little chin she's growing and doing well. It was a fun day. Hope you are having a good Halloween. Bring on the trick-or-treaters! 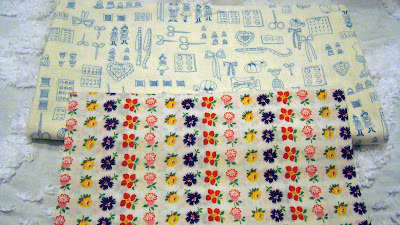 Sew Mama Sew has some great new fabric from Lecien. It is by designer Rosalie Quinlan. This fabric speaks to me. It is called Grandmother's Flower Garden and it comes in several colorways. 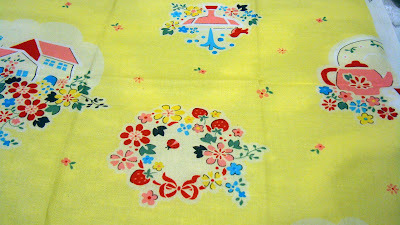 The yellow with the teapots and flowers/fruit/house/bird/etc. is my favorite. If there was a perfect line for my patterns - this would be it. 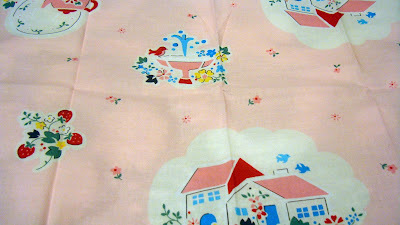 Can't you see teapots and little houses and kitchens out of this fabric? 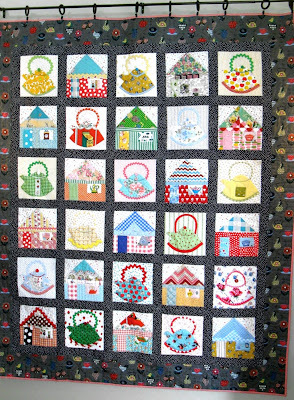 I will definitely have to make another Kettles in the Kitchen quilt with this. The pink is very cute too. I love the strawberries and the little birds flying over the house. And look at the darling bird bath. 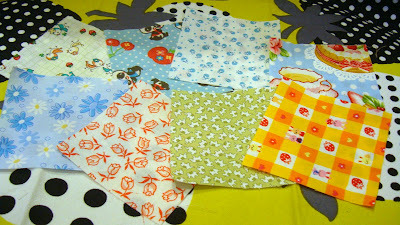 Here are some of the companion fabrics. Classic gingham never goes out of style. I like how the gingham is behind the wreaths and designs on the fabric to the left. It is nice to see this line of fabric is being sold at more main stream sources for us in the USA. 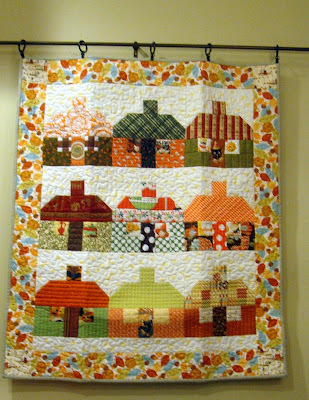 This is my Halloween cottage quilt I made last year from my cottage tutorial. 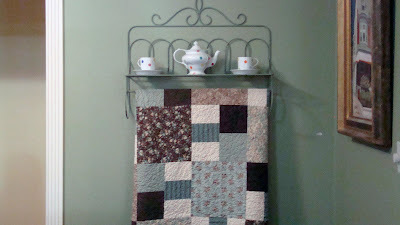 I have had the quilt hanging in my sewing room for all of October. I do love it in the Halloween fabric. 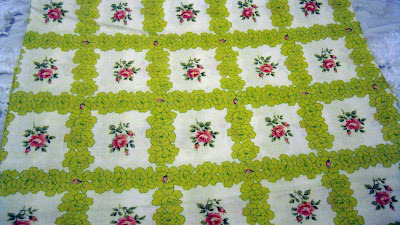 But can't you just see this same quilt made with the Grandmother's Flower Garden fabric above? Happy Halloween. And Happy Birthday Shelbie. I'm such a fan of the 'post ahead' option on blogger and I'm using it today. I'm probably playing "nanny" while you read this. I've really never wanted to be called grandma so I'm hoping the family will get used to calling me Nanny. It just seems to fit me. Well after my struggles last week with the whirligig, Jodi of Pleasant Home came to my rescue!! Thanks so much Jodi. I totally get by with a little help from my friends. And this made all the difference in the world. Jodi has these whirligig templates that she sells in her Etsy store (so inexpensive!). And she sent them to me. I don't really know how I'd ever do this again without them. And this is now my new favorite block. 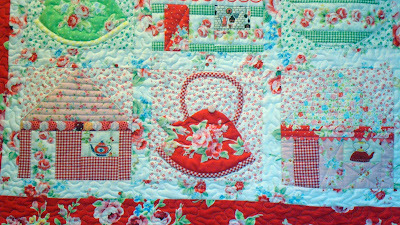 When things go the right way, quilting is just so much fun. 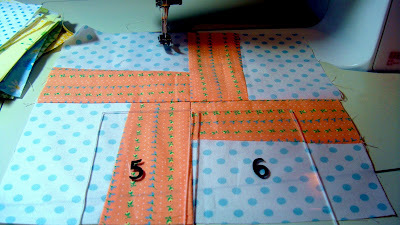 I'm using Jodi's templates to make the whirligigs in the quilt I'm finishing up for my sister Michelle. 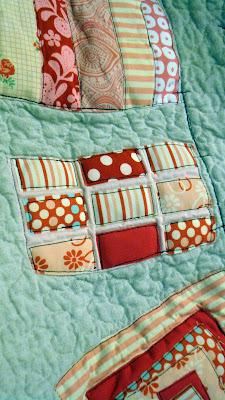 Michelle has some embroidered blocks she made that need some companion quilt blocks to put together for complete project. 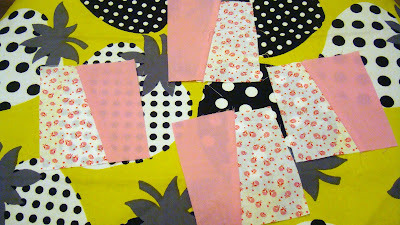 It is nice to cut these out and have a few moments here and there to sew them together. I'm afraid I made more blocks than I need but now I'm ahead on my next project. Thanks again Jodi. They worked out perfectly. Today is Laurie's birthday. She's 17. Laurie may be the 7th of 8 in our family but she's an original and completely her own girl. It is hard to get Laurie (right) in a photo alone because she gets along with everyone in the family so well. To be fair, we have now 5 birthdays in October. 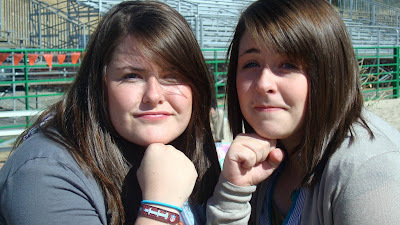 Shelbie (left) will have her birthday on Halloween. Tracey and Whitney (next in photo) had their birthday on the 21st. And today is Laurie's (the one with the hands up) birthday. Mason is just along for the ride in this pic. And now that we have Allison Freda, that makes 5 birthdays. It is a busy month. Add a wedding anniversary to that mix. 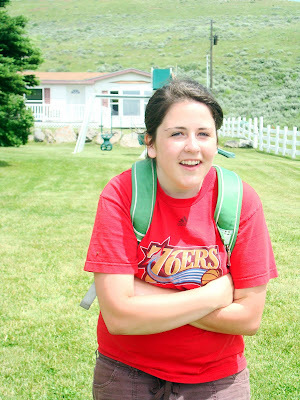 This is a typical Laurie picture. She's always doing something funny and original. Poor Shadow is the foil here. But I doubt he minds. 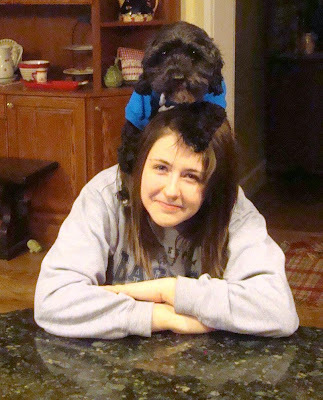 Shadow is the subject of so many funny family pictures. More birthday cake for all. 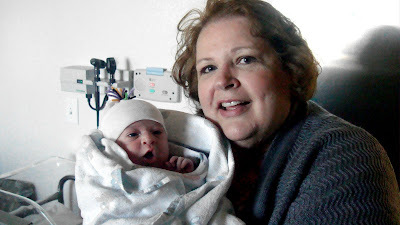 Brand new baby and Grandmother here. 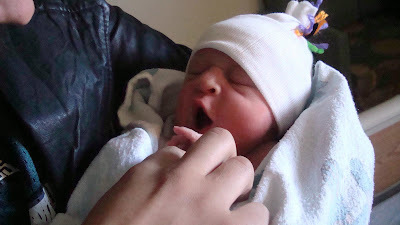 Yes it is exciting and wonderful to be a grandmother. Allison Freda Sellers born Sunday morning at 9:47 AM. She was nearly a week overdue. 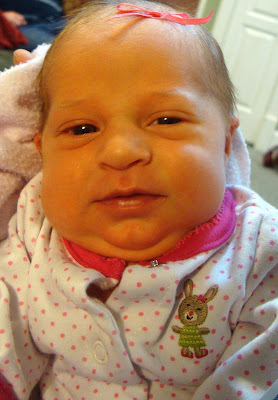 But it might be a good thing because she was only 6 lb. 9 oz. I'm so honored that they chose my mother's name for Allision's middle name. My mom would be so happy. 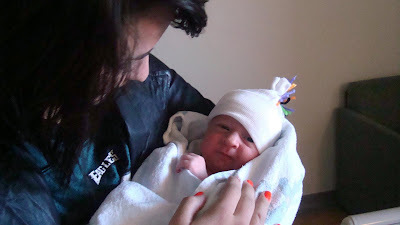 Aunt Chelsey holding Allison. Allision is the first grandchild on both sides. She will be super spoiled. Mom and baby are both doing very well. We are so grateful that after a difficult week Whitney was able to deliver a healthy baby without complications. She's so darling! Hi for Friday. It has been kind of an up and down week. Some of the family has been sick and the overdue baby hasn't presented herself yet. I have some fabulous friends. I say that all the time. They do so much for me and I don't deserve it. 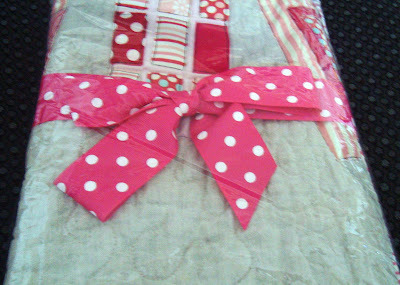 This fabric above is from Sandi. 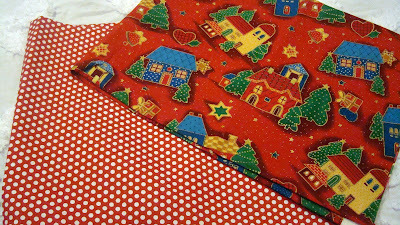 Love the Christmas fabric. I will so enjoy the red dots and the Christmas village is perfect for me. 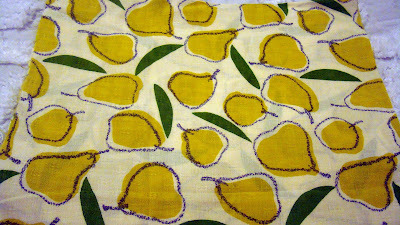 Did I show this fabric before? (Yes, I am losing my mind.) Thanks Sandi. Today when I got home from work I had a little package waiting for me from Washington. It had my friend Nan's address on it. She's such a thoughtful friend. She brought me some treats from Houston Quilt Market. 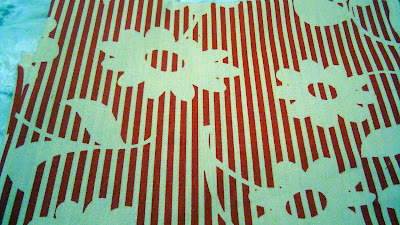 She found a booth with some vintage and japanese fabric and thought of me. What a great pal! 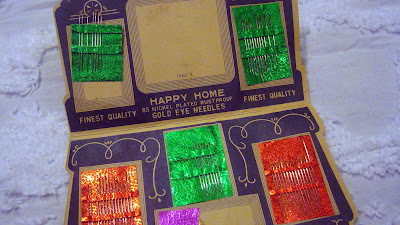 This vintage needle book was included. Apparently they were quite worried about rusty needles back then because they tout this as something wonderful. I love the vintage art work. The needles are indeed sharp and rust free! 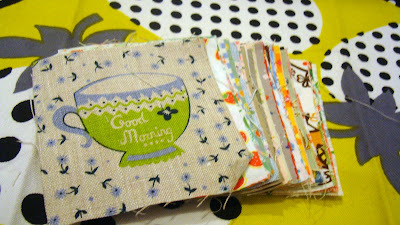 These two little fabric gems were in the package. They are perfect and so "me". Nan has great taste and I mean that literally. She's a quilter and a chef. 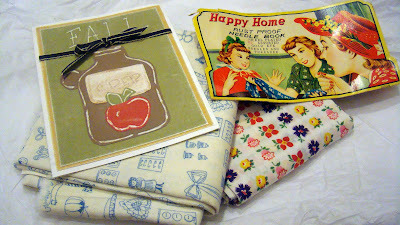 I bought 2 fat quarters recently at my little quilt shop just 4 minutes from my house called Just Sew. My friend Sandra works there and it was fun to catch up with her and browse the fabric. 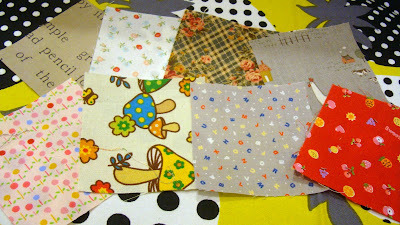 Now for some fabric from stash. I love these pears in a mid century reproduction print. I can think of lots of good uses for this print. Think clutch. This red is a thick cotton, not really a quilting weight. I think it would make a really cute tote bag. I haven't used this lovely floral yet. It is so sweet but can't seem to cut into it for some reason. The scale has to be "just right" for a project I guess. I realllly hope we get a baby this weekend. But if not she'll be induced next week. Happy Weekend all. My friend Ashley is having a baby girl any day now. Ashley and my daughter Whitney are due very close together. 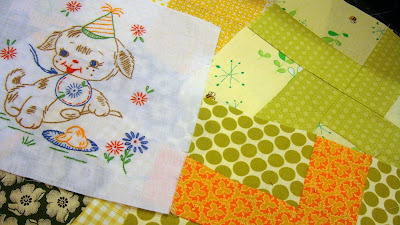 I need to finish a baby quilt for Ashley as I wait for our own baby to arrive. 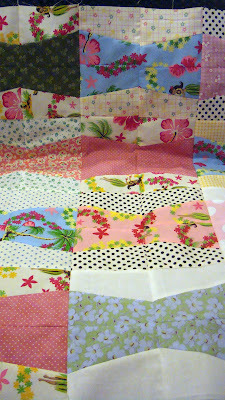 I'm not quite done with the flimsy yet but I'm making progress and enjoying the scrappy Hawaiian look to this quilt. 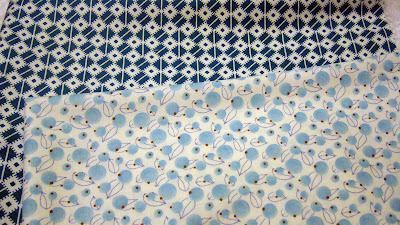 Lisa sent me some fabrics from the island recently. I love them. And immediately I thought of my friend Ashley's baby. Ashley's baby will be half Hawaiian, just like her son. When she was pregnant with her first child I made him a quilt with Hawaiian fabric. 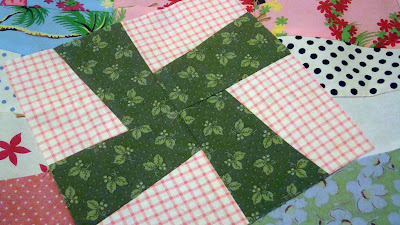 Well I wanted to make a whirligig quilt. I went to Penny's blog to see how it is done. Unfortunately I just looked at the pictures and thought I could wing it. And I did it perfectly for my "proof" block. 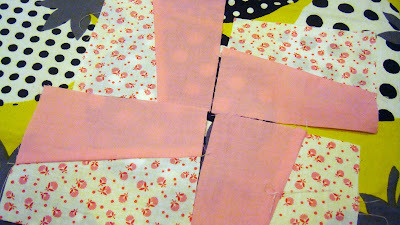 But when I went to cut out the fabric for the rest of the quilt I made some technical errors. I just don't know how I did it. But I cut out the parts backwards for half of the blocks. That is what happens when I don't read directions, I guess. As you can see this doesn't make a whirligig. Sigh. Oh well. I won't give up. 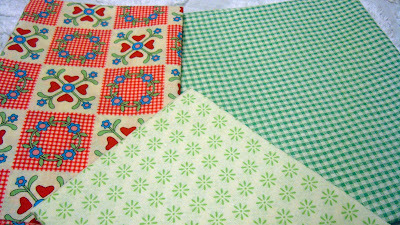 My next project I was planning on a whirligig too, so I'll try again. 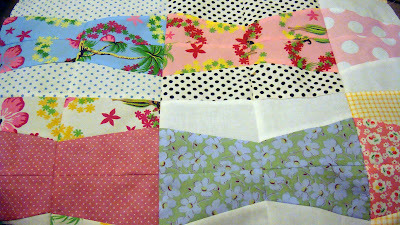 Lucky for me I used the Hawaiian quilt blocks in a different way. I think it will turn out. I couldn't possibly toss this fabric. I'll post more when it is done and we'll see how it all looks together. Yesterday was my twins birthday. I think Whitney is glad she didn't have the baby on her birthday but I think she's getting to the point where ANY day is a good day to have a baby. My new pattern is out and in my etsy store. I'm so glad to have completed it and have it all put together. It has been a long time coming but I'm very pleased with it. Thanks again to my helpers for their proofreading and proof sewing. What would I do without friends? 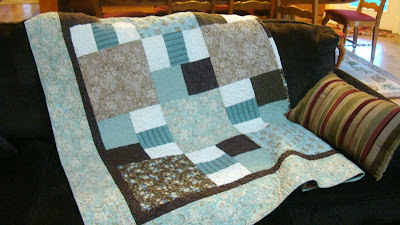 It is a really fun quilt to make. 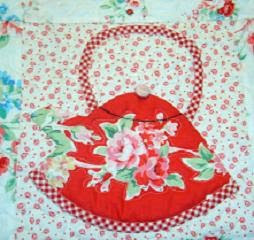 I'm currently making another sample quilt to hang in a local store and enjoying making my 3rd Kettles in the Kitchen. There are 2 versions, a smaller wall hanging quilt and a full sized quilt. 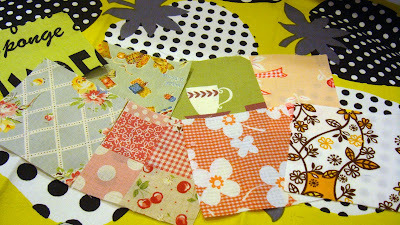 Of course fussy cutting is the heart of the quilt. Thanks to Lori for spotting a location for me to take a few photos, too. Now onto the next project! I have been incredibly lucky recently. I won 2 really really great giveaways. I was on a roll a while back but it has been a long dry spell for blog giveaway wins here and I picked a great time to have my luck change. Jacquie is someone that inspires me and I learn so much from. She's very talented and I love everything she does. 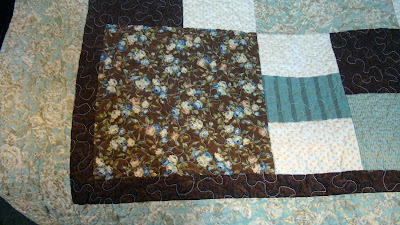 I won a quilt (yes a quilt) made by Jacquie. This was the package. And this was what was inside! A mini quilt of quilts hanging on the clothes line. 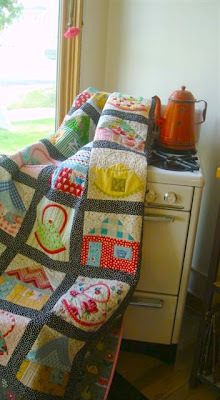 I've admired Jacquie's clothesline quilts and have been wanting to make something like this myself. In fact I had been thinking of this for over a year now. 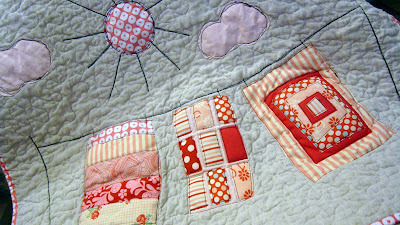 Of course I immediately fell in love with this quilt when I saw it on Jacquie's blog. I put this pic on facing the wrong way but decided to leave it like that because it looked cute and was different, just like Jacquie. Now I get to think about where in my house to hang it! This is going on the wall. Thanks Jacquie. And I also won, yes, another quilt!! Can you believe it? The sweet and fabulous Dawn had a giveaway. 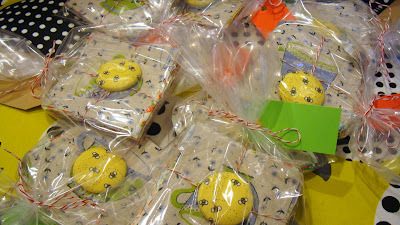 Dawn is a blog friend and a real life friend. Recently Dawn had a blog anniversary giveaway. And she drew my name! I was so happy to win something made from Dawn with love and incredibly enough - it matches my new family room furniture and decor. And this is where it is going to live. And be enjoyed. The whole family was excited to get it and be able to use it in the family room. They ripped the package open before I even had a chance to grab my camera. 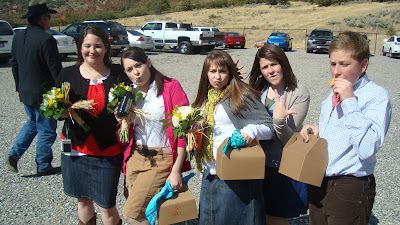 We even took the quilt to the wedding and used it over a bale of hay. It is just so perfect in my family room I can't believe it. Thanks Dawn! Ok so Friday I said I would draw a name from over the weekend for this little pack of Hive Squares. 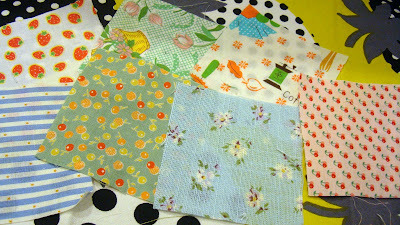 I used a random number generator and the winner of a little pack of Hive Squares is . . .Lynn from Diary of a Mad Quilter. Yayyy Lynn. Thank you all for leaving comments and participating. I loved all the great ideas for using the squares. A giveaway is always fun. I always feel like I'm behind in life, but of course lately more so. I'm glad to show FFF today with my little Hive Squares. If you've been reading the latest Quilt Market News you may have heard about an upcoming product from Moda called Moda Bakeshop Sampler Box. Moda is featuring sample size portions of their fabric lines in packs of 2 1/2" square. I will definitely want some. 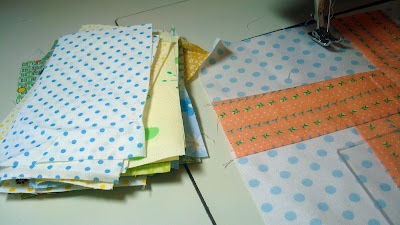 I've been cutting samples of Freda's Hive stash fabric and have been packaging them. I'm calling them Hive Squares. 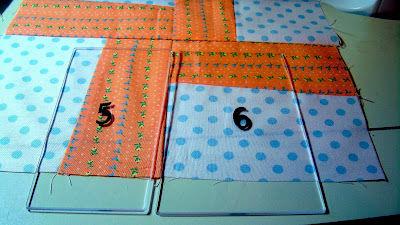 They are packs of 36 different fabrics cut to 3 1/2" square. 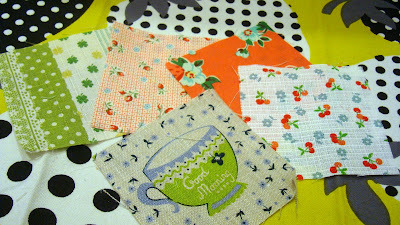 So my idea of little charms from my stash goes along with what is happening in the fabric world. I guess. These little Hive Squares are being sent out to some Worker Bee helpers and are long overdue. I originally thought about cutting the Hive Squares into 2 1/2" since I use that size so much, but I thought just 1" larger offered more possibilities for use. 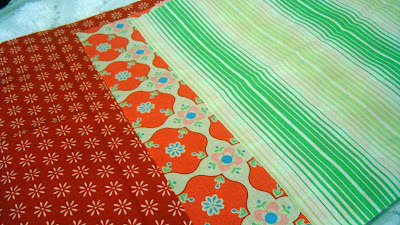 The fabrics are 90% Japanese fabrics from smaller pieces of my stash. With some others thrown in. They don't go together with any color variety or style but they are cute together anyway, I think. I'm not publicizing the giveaway so it will be just for those that happen on my blog or for my regular readers. It isn't a huge prize but just a little fun bit of fabric to enjoy. I recently won 2 fabulous giveaways so I thought it would be fun to give a little back. 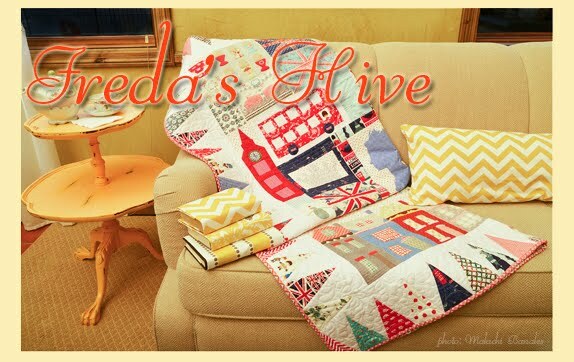 Monday I'll show the 2 prizes I won from friends blogs and announce a winner of the Hive Squares. Shh If you tell then you have less of a chance to win! Have a relaxing weekend. I certainly plan on it!